Community and School Gardens Series: Planning an Edible Garden (C 1027-1) This publication describes three steps for planning a school garden: garden location, soil and terrain, and choosing crops. Community and School Gardens Series: Sources of Water for the Garden (C 1027-11) This publication discusses the advantages and disadvantages of various sources of water for a community or school garden, including municipal water, rivers or creeks, ponds, wells and rainwater. Community and School Gardens Series: Irrigation (C 1027-12) This publication describes irrigation methods suitable for community or school gardens, including overhead sprinklers, hand watering and drip irrigation. Community and School Gardens Series: Weed Control (C 1027-13) This publication describes weed control methods that are appropriate for community and school gardens. Community and School Gardens Series: Raised Beds vs. In-Ground Gardens (C 1027-3) This publication describes the advantages and disadvantages of raised bed and in-ground gardens and may be used as a guide when planning a community or school garden project. Community and School Gardens Series: Raised Garden Bed Dimensions (C 1027-4) This publication helps determine the ideal dimensions of raised beds for community and school gardens by focusing on three things: materials, slope and accessibility. 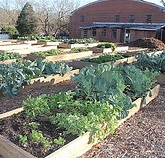 Community and School Gardens Series: Raised Bed Materials (C 1027-5) This publication describes the advantages and disadvantages of various materials used for building raised beds, including types of wood, composite materials, recycled materials, and kits. Community and School Gardens Series: Less Expensive Sources of Plant Material, Amendments and Tools (C 1027-6) This publication offers advice on finding less expensive sources of plant material, amendments and tools for community and school gardens. Community and School Gardens Series: Garden Sheds (C 1027-7) This publication provides information about storage sheds for community and school gardens, including local building codes, siting a shed, and alternatives to traditional sheds. Community and School Gardens Series: Garden Fencing (C 1027-9) This publication describes options for fencing a community or school garden, including fence types and materials.